Due to the AAFC's poor financial situation, however, the league disbanded after the 1949 season. Three AAFC teams—the Cleveland Browns, the San Francisco 49ers, and the original version of the Baltimore Colts—were absorbed into the NFL in 1950. The league was briefly known as the National-American Football League during the offseason, but reverted to the traditional name of "National Football League" by the time the 1950 season began. The Browns would go on to shock NFL loyalists by dominating the older league and winning the championship in their first NFL season. After the NFL absorbed the AAFC, it went unchallenged by U.S. rival leagues throughout 1950s. The only other professional football leagues in operation were the leagues that would merge to form the Canadian Football League in 1958. The Interprovincial Rugby Football Union (forerunners of the CFL's Eastern Conference) managed to achieve a modest following in the U.S. after landing a contract with NBC (the AFL's future television partners). A key difference between the 1950s and today was that the Eastern Canadian season started at around the same time as the NFL's—Canadian teams at this time typically played two games per week so as to finish the season before the harsh Canadian winter set in. This arrangement allowed for NFL teams to travel north of the border for preseason contests with the CFL's Eastern clubs. NFL teams handily won most of these contests. The other major Canadian league (the Western Interprovincial Football Union, forerunners of the CFL Western Conference) was mostly ignored by the NFL, partly because it was still seen to be inferior even to the Eastern Canadian teams, but mainly because it would have been unfeasible to travel to Western Canada for a preseason game at a time when professional sports teams travelled by rail, and also because by this time the Western Conference was already moving toward an earlier start to its season. All of the professional leagues, including the NFL, were gate driven enterprises; thus, although the NFL enjoyed a noticeable financial dominance over the game, it was quite modest by modern standards. In any event, the Canadian league enforced strict limits on the number of American players on their rosters, while the dominance of ice hockey in Canada kept the Canadian football talent base small. This meant that NFL owners did not need to significantly outspend Canadian teams in order to dominate the game on the field. In the absence of a players union or another U.S. league, NFL owners' main concern was to make their league as profitable as possible. Teams spent as little as possible on player salaries. In 1959, Lamar Hunt, son of Texas oil magnate H. L. Hunt, attempted to either gain ownership of the Chicago Cardinals with Bud Adams and move them to Dallas, or own an NFL expansion franchise in Dallas. In 1959, the NFL had only two teams that were south of Washington, D.C. and west of Chicago: the San Francisco 49ers and the Los Angeles Rams, both in California. The league, however, was not interested in expansion at the time. Rebuffed in his attempts to gain at least part ownership in an NFL team, Hunt conceived the idea of a rival professional football league, the American Football League. In September 1959, Hunt was approached by the NFL about an expansion team in Dallas, but by then Hunt was only interested in the AFL. A 14-game regular season schedule, which the NFL adopted in 1961 (increased from 12 games), exactly one year after the AFL's inaugural season. The CFL's Eastern and Western Conferences had already been playing 14 and 16 game schedules, respectively, for several years. The AAFC in the 1940s also played a 14-game schedule. Players' last names on the jersey back (adopted by the NFL in 1970). A flashier, exciting style of play, as opposed to conservative-style NFL game plans. Assisted by a slightly narrower and longer ball, the Spalding J5V, which was easier to throw than the NFL ball, "The Duke" from Wilson. The introduction of the two-point conversion to pro football, conforming to the college rule adopted in 1958. This AFL rule was dropped after its last season in 1969. It was later adopted by the NFL in 1994. Official time on the scoreboard clock, as opposed to it being kept by on-field officials. One network television broadcast package for league games, first with ABC from 1960 through 1964, then with NBC. The sharing of gate and television revenues by home and visiting teams. Nevertheless, the AFL enjoyed one critical advantage over its established rival, which was that its owners on average were wealthier than their NFL counterparts. With a few notable exceptions such as the notorious Harry Wismer in New York, Hunt had successfully recruited owners who not only had deep pockets, but more importantly, unlike earlier leagues, most AFL owners had the patience and willingness to absorb the inevitable financial losses of the fledgling league's early years. Therefore, in spite of the bad press, and unlike the NFL's previous rivals, the AFL was able to survive and grow, and began to prosper in the mid-1960s after the relocation of the Chargers and Texans to non-NFL markets, the sale and rebranding of the New York Titans (to the Jets), and the Jets' signing of University of Alabama quarterback Joe Namath to an unprecedented $427,000 contract. The league's financial survival was further buoyed by NBC's $36 million, five-year contract to televise AFL games beginning in 1965. As the rivalry between the leagues intensified, both leagues entered into a massive bidding war over the top college prospects, paying huge amounts of money to unproven rookies in order to outbid each other for the best players coming out of college. The bidding wars escalated in the mid-1960s, with the respective drafts held on the same day in the late fall. Because of the intense competition, teams often drafted players that they thought had a good chance of signing, instead of selecting the best available players. For example, 1965 Heisman Trophy winner Mike Garrett, a running back from USC in Los Angeles, was expected to sign with an NFL team, so he was not taken in the 1966 AFL draft until the 20th (final) round by the Kansas City Chiefs. In the 1966 NFL Draft, he was taken by the Los Angeles Rams with the 18th overall selection. Garrett surprisingly shunned the NFL and signed with Kansas City; he helped lead them to the AFL title as a rookie. The previous year, the Chiefs used their first round pick on Gale Sayers, who signed with the NFL's Chicago Bears. By contrast, many NFL owners had comparatively little wealth outside the value of their respective franchises. The NFL consistently outdrew the AFL at the gate, especially in the AFL's first few seasons, thus ensuring that the older league's franchises remained considerably more lucrative enterprises compared to their AFL rivals. Nevertheless, NFL owners knew they did not have unlimited resources to wage a protracted bidding war with the AFL. Under this environment, the two leagues quickly came to a gentlemen's agreement—once a player signed with a team, be it from the AFL or NFL, teams in both leagues were expected to honor each other's player contracts and not sign players who were under contract with a team in the rival league. The unwritten agreement was broken in May 1966 when the NFL's New York Giants signed Pete Gogolak, the first professional soccer-style placekicker, who had played out his option in 1965 with the AFL's Buffalo Bills. The NFL's breach of trust resulted in retaliation by the AFL: Oakland Raiders co-owner Al Davis took over as AFL Commissioner in April 1966, and he stepped up the bidding war after the Gogolak transfer, signing notable NFL players, including John Brodie Mike Ditka, and Roman Gabriel to contracts with AFL teams, but after the merger agreement in June, they wound up staying in the older league. Both leagues spent a combined $7 million signing their 1966 draft picks. The two leagues would combine to form an expanded league with 24 teams, to be increased to 26 teams by 1969, and to 28 by 1970, or soon thereafter. The expansion commitment was included primarily to mollify Congressional opposition (especially from locales which still lacked professional football) which the owners knew would follow any proposed merger. The teams eventually added were the New Orleans Saints in 1967, the Cincinnati Bengals in 1968, and the Seattle Seahawks and Tampa Bay Buccaneers in 1976 (the Seahawks and Buccaneers were added after the completion of the merger). The Atlanta Falcons and the Miami Dolphins were already established and set to start play for the 1966 season, before the merger was announced in June. All existing franchises would be retained, and none of them would be moved outside of their metropolitan areas. The agreement also stipulated that no new franchises were to be placed by either league within the media markets of the other. Among other things, this particular clause of the agreement effectively ended the city of Milwaukee's pursuit of an expansion AFL team following an unsuccessful effort to lure the Green Bay Packers to Milwaukee full-time. AFL "indemnities" would be paid to NFL teams which shared markets with AFL teams. Specifically, the New York Giants would receive payments from the New York Jets, and the San Francisco 49ers would get money from the Oakland Raiders. The shared-markets issue was part of earlier, informal merger talks (held as early as 1964), talks the AFL rejected when the NFL wanted the Jets and Raiders relocated (to Memphis and Portland, respectively). The two leagues would officially merge in 1970 to form one league with two conferences. The merged league would be known as the National Football League. The history and records of the AFL would be incorporated into the older league, but the AFL name and logo would be retired (although the AFC's pre-2009 logos were largely based on the old AFL logo). NFL Films would start recording game footage for the AFL starting in 1968 under a newly-established "AFL Films" division, which was simply the regular NFL Films crew wearing separate jackets to appease AFL loyalists. Although Pete Rozelle had not initiated the merger negotiations, he quickly endorsed the agreement and remained in his post as NFL Commissioner. Although he was not formally invested with any new title(s), Rozelle was often referred to as the football commissioner or commissioner of football in the media during the four years following the merger agreement. The pre-existing office of NFL President continued effectively unchanged following the agreement. Then occupied by Cleveland Browns owner Art Modell, the NFL presidency was (both before and after the merger agreement) essentially an honorary title that operated in a manner similar to the way in which the league presidencies of MLB operate in the 21st century. The combined league would eventually expand to 28 teams as stipulated in the merger agreement. Stadiums seating less than 50,000 were declared to be inadequate for professional football's needs, thus compelling teams in stadiums with capacities under that number to expand their current stadiums (most notably the expansion of the Denver Broncos' Mile High Stadium in 1968) or move to newer, larger homes—most notably the Chicago Bears' move from Wrigley Field to Soldier Field in 1971, and the opening of new stadiums for the New England Patriots (Schaefer Stadium in 1971), Kansas City Chiefs (Arrowhead Stadium in 1972), and Buffalo Bills (Rich Stadium in 1973). (The Minnesota Vikings stayed at Metropolitan Stadium, the only sub-50,000 capacity stadium after the merger, until the Hubert H. Humphrey Metrodome opened in 1982.) 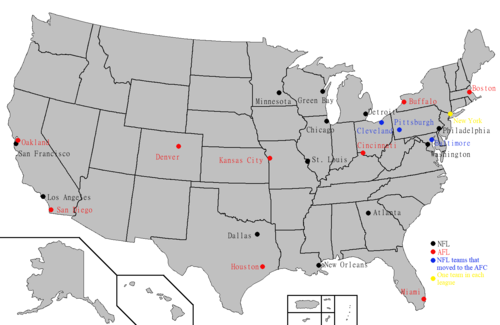 It was this stadium issue that prevented Seattle and Tampa Bay from receiving their expansion teams until 1976; both cities were recruiting the Bills and Patriots to relocate to their cities (in defiance of Rozelle's promise) should they not be able to build a compliant stadium in their home market, and only after those stadiums were built and relocation of existing teams ruled out that the league could issue expansion teams to Seattle and Tampa Bay. Since the 1970's, the league has only played occasionally in sub-50,000 seat stadiums. Exceptions include the 1998 NFL season when the Tennessee Oilers played one season at 40,550 seat Vanderbilt Stadium and also from 2017 to present when the Chargers returned to Los Angeles and temporarily moved into the 27,000 seat Dignity Health Sports Park (known as StubHub Center before 2019) until Los Angeles Stadium at Hollywood Park opens in 2020. Eventually, Congress passed the new law to permit the merger to proceed. The terms of the merger called for the NFL and AFL to add one team each prior to the 1970 season. Louisiana Representative Hale Boggs and Senator Russell Long were instrumental in passage of the new law, and in return, Rozelle approved creation of the expansion New Orleans Saints franchise less than one month after the bill was signed into law by President Lyndon B. Johnson. The tenth and final AFL franchise was awarded to former Cleveland Browns owner and coach Paul Brown in Cincinnati. Brown had been seeking a way back into the NFL after being forced out of the Browns organization by Modell. Brown had not been a supporter of the AFL prior to the merger announcement, but quickly realized the AFL was probably his only viable path back into NFL after the older league awarded its sixteenth franchise to New Orleans. Also, Cincinnati was not going to have a 50,000 seat stadium ready until 1970. Brown paid $10 million for his franchise (400 times the 1960 franchise fee of $25,000), famously stating "I didn't pay ten million dollars to be in the AFL." These five combinations were written up on slips of paper, sealed into envelopes and put into a fish bowl (other sources say a flower vase), and the official NFC alignment—Plan 3—was pulled out by Rozelle's secretary, Thelma Elkjer. Of the five plans considered, the one that was put into effect was the only one which had Minnesota remaining in the Central Division and Dallas playing in the Eastern Division. This preserved the Vikings' place with geographical rivals Chicago, Detroit, and Green Bay, and the Cowboys' rivalries with the Redskins, Eagles and Giants. It also was the only one of the final five proposals in which there were no warm weather cities in the Central Division. More controversially, the new alignment put both of the two newest NFC franchises, the Saints and Falcons from the Deep South, with the 49ers and Rams. The Falcons had already been playing the California teams in the NFL Coastal Division, but the Saints were in the NFL Capitol Division (with Dallas, Washington, Philadelphia) of the Eastern Conference and now faced two trips to the West Coast per season. The Rams were expected to dominate the West, but the 49ers won the division in its first three seasons before the Rams won the next seven titles. Many observers believe that the NFL got the better end of the bargain, as Oakland Raiders owner Al Davis and New York Jets owner Sonny Werblin resisted the indemnity payments. Long-time sports writer Jerry Magee of the San Diego Union-Tribune wrote: "Al Davis taking over as commissioner was the strongest thing the AFL ever did. He thought the AFL–NFL merger was a detriment to the AFL." However, other observers consider those scenarios far-fetched: the NFL had a richer television contract at the time of the merger, in large part because of market exclusivity in such leading population centers as Los Angeles, Chicago, Detroit, Philadelphia, Washington, Baltimore, and Atlanta and Dallas-Fort Worth, which were rapidly increasing in population and would emerge as media strongholds in the 1970s. On the other hand, the AFL had teams in cities that were not among the nation's leading media markets, such as Miami, Buffalo, and Denver (all of which at the time had no other major league teams), and Kansas City (which at the time had only a failing baseball team that was ultimately relocated). Some of these American Football League fans were disappointed because they wanted their league to continue; those feelings were reinforced when American Football League teams won the final two AFL-NFL World Championship games after the 1968 and 1969 seasons. Nevertheless, despite the AFL triumphs in Super Bowls III and IV, the old-guard NFL was still widely expected to dominate the merged league over the course of an entire season. In 1970, these predictions were proven to be more or less correct: out of 60 regular season games pitting old-line NFL teams versus former AFL teams, former AFL teams went 19-39 (two games ended in ties). Only Oakland managed to post a winning record against old-line NFL opposition, going 3-2. Nevertheless, out of the three NFL teams to join the AFC, only the Colts managed to secure a playoff berth. The Browns and Steelers both missed out due to a stunning second-half performance by the Cincinnati Bengals, who overcame a 1-6 start and their two old-guard division rivals to secure the first-ever NFL playoff berth for a third year expansion team. Ultimately however, it was the Colts who were triumphant—they defeated both the Bengals and Raiders to become the first team to represent the AFC in a post-merger Super Bowl, where they defeated the Dallas Cowboys 16-13 to win Super Bowl V, the franchise's last NFL championship in Baltimore. Even the undefeated Miami Dolphins were slight underdogs to the old-guard Washington Redskins in Super Bowl VII, but Miami won 14-7 to cap the only perfect championship season in NFL history. Not until Super Bowl VIII in 1974 was a former AFL team favored to win the Vince Lombardi Trophy, with the Dolphins trouncing the Minnesota Vikings 24-7 to repeat as champions. Each of the first 29 games on Monday Night Football featured at least one team from the old-guard NFL, with the first nationally televised prime time game between two former AFL teams being Oakland at Houston on October 9, 1972. Eventually, the AFC teams caught and passed the NFC during the mid- to late-1970s. But even then, NFL proponents claimed that the three NFL teams that joined the AFL to form the AFC were largely the reason. Altogether, these teams played in each of the first three AFC Championship Games, and in eight of the first ten games (out of which they won five). However, while the Colts and Browns were respectable playoff contenders during this period, it was the Steelers who dominated the league, winning four Super Bowls in six years in 1974-1979. From the perspective of AFL proponents, this was not a continuation of "old NFL" dominance. Before the merger, the Steelers had been perennially close to or in last place in the NFL since their foundation in 1933, including a 1-13 record in 1969 (tied with the Chicago Bears for the worst record in the NFL), with only eight winning seasons and just one playoff appearance (in 1947, where they were shut out) in that time. The $3 million relocation fee that the Steelers received for joining the AFC after the merger, along with winning a coin-flip tiebreaker against the Bears for the number one pick in the 1970 NFL draft (which ended up being future Hall of Fame quarterback Terry Bradshaw) helped them rebuild into a team that could actually compete with the other "old NFL" teams. The merger paved the way for a new era of prosperity for the NFL. While a number of rival major professional football leagues have commenced play since 1970 including the XFL, WFL, USFL and UFL, and while the CFL once experimented with U.S.-based teams, none of these ventures came close to being a serious challenge to the NFL. The aforementioned U.S. leagues folded outright after one, two, three and four seasons respectively, while the CFL reverted to being an all-Canadian league after three seasons. The Baltimore Ravens started play in 1996, as a result of the controversy stemming from Art Modell's attempt to relocate the Browns to Baltimore. Subsequent legal actions saw a unique compromise in which he was only allowed to take the players, coaches, and front office staff to Baltimore (even then, not all of them made the move), and the Browns' team colors, uniforms, and history would remain in Cleveland to be inherited by the resurrected Browns franchise. As a result, although it was effectively a continuation of the football organization that operated in Cleveland until 1995, Modell's Baltimore team is reckoned to be an expansion franchise that commenced play in 1996. Meanwhile, the club in Cleveland, although it was effectively a brand new football organization stocked by an expansion draft, is recognized to be a continuation of the franchise that commenced play in 1946 and joined the NFL in 1950. The agreement with the NFL was contingent on finding a new owner and the completion of a new stadium in Cleveland, as a result, the Browns were officially reckoned to have "suspended operations" for three years and the number of active NFL teams did not increase to 31 until the 1999 season. Prior to the Browns' reactivation, the NFL briefly considered re-aligning the AFC into four divisions of four teams each while leaving the NFC alignment unchanged. Due in large part to the difficulties an uneven number of divisions would have caused for scheduling inter-conference games, the proposed AFC re-alignment was shelved. As a result, the Browns were placed back in the AFC Central, which expanded to six teams as a result. The Houston Texans joined in 2002, after Houston was left without the NFL for five years following the Oilers' move to Nashville, Tennessee, where they eventually became the Tennessee Titans. The Texans' establishment made feasible the realignment of both conferences into four divisions of four teams each, which allows every team to play every other team at least twice over an 8-year span (once at home, once on the road). Houston was once again placed in the AFC. To make room for the Texans, the Seattle Seahawks agreed to return to the NFC. In total, out of the first 47 AFC Championship Games, sixteen have featured two former AFL teams and 45 have featured at least one former AFL team—the only exceptions being the 1995 championship game between the Steelers and Colts, and the 2008 game between the Steelers and Ravens. Out of the first 46 post-merger Super Bowls, former AFL teams have won 12, lost 21 and did not qualify for the remaining 13. The latter 13 games have all involved one of the three "old guard" organizations that joined the AFC in 1970, with the Steelers playing in eight, the Colts in three (one representing Baltimore and two representing Indianapolis) and the Ravens in two. Somewhat ironically, the two AFL teams that won Super Bowls prior to the merger (the Jets and Chiefs) are also the only two former AFL teams that have never played in a post-merger championship game. Four extant NFL teams have yet to reach the Super Bowl at all, including two pre-merger NFL franchises (the Browns and Lions) and two post-merger expansion teams (the Jaguars and Texans). It should also be noted that the Houston Oilers never reached a post-merger championship game prior to relocating to Tennessee, thus making Houston the only AFL city that has yet to send a team to the Super Bowl. In spite of Rozelle's promise that there would be no re-locations involving teams in existence at the time of the merger, by the end of his tenure as commissioner in 1989 three franchises had moved to a different market from where they were based in 1970 (although the league did take legal action in an unsuccessful attempt to prevent the first such move, that of the Raiders, from taking place). As of 2018, six NFL franchises (the Raiders, Colts, Cardinals, Rams, Oilers/Titans and Chargers) have been involved in post-merger re-locations while an additional franchise (the Browns) temporarily suspended operations as an alternative to re-location. Of the six teams that have re-located since the merger, two (the Raiders and Rams) have returned to the cities they played in at the time of the merger, while the other teams only moved once. However, the Chargers, who had moved to San Diego in 1961 before the merger, returned to Los Angeles in 2017, making them the only team to go through a relocation as a member of both leagues. Also, the Raiders are bound to move a third time, leaving Oakland for Las Vegas either in 2019 or 2020. Of the ten teams that competed in the AFL in 1969, seven have been continuously based in their 1969 market, one (the Raiders) returned to their original city after moving to a different city post-merger, one (the Oilers) no longer plays in their original city and one (the Chargers) has returned to its original AFL city after a relocation that took place before the merger. However, the Raiders are bound to move a third time, leaving Oakland for Las Vegas either in 2019 or 2020. The Rams' return from St. Louis to Los Angeles ended an interval lasting 21 years in which there was no NFL team in L.A. - the longest such period involving any NFL city of the post-merger era, and resulted in St. Louis replacing Los Angeles as the only 1969 NFL city without a current NFL team. The NFL has not simultaneously fielded teams in all sixteen of its 1969 markets since the Colts relocated to Indianapolis after the 1983 season. It had fielded teams in all ten 1969 AFL cities from the 2002 season (when the Texans joined the league) until the conclusion of the 2016 season (when the Chargers returned to Los Angeles, leaving San Diego without an NFL team). Neither Portland nor Memphis (the cities that were due to receive AFL franchises via relocation in the rejected 1964 merger proposal) have received an NFL franchise as of 2017. Memphis in particular has made repeated bids for an NFL team (including the Memphis Hound Dogs and the Memphis Grizzlies court case), but all have failed. Memphis would later serve as a temporary home to the Tennessee Oilers for the 1997 season following their departure from Houston. The agreement was originally slated to last for two seasons, but lackluster fan support in Memphis caused the arrangement to be cut short. The Super Bowl has been used as an incentive by the league to convince local governments, businesses, and voters to support the construction, seat licenses and taxes associated with new or renovated stadiums. Therefore, the league has and continues to award Super Bowls to cities that have built new football stadiums for their existing franchises, though all outdoor Super Bowls continued to be played in warmer climates, with the exception of Super Bowl XLVIII played in the new Meadowlands stadium. The Kansas City Chiefs, Cleveland Browns, Cincinnati Bengals, Denver Broncos, Houston Texans, Pittsburgh Steelers, Philadelphia Eagles, Chicago Bears, Tampa Bay Buccaneers, Seattle Seahawks, Arizona Cardinals, Indianapolis Colts, and Minnesota Vikings are all teams who have recently[when?] received a significant amount of public financing to either construct or upgrade the stadiums in which they currently play. Ice hockey: In 1972, the World Hockey Association formed to compete with the National Hockey League. The two entities merged in 1979, with four of the six remaining teams—the Edmonton Oilers, Hartford Whalers, Quebec Nordiques and the Winnipeg Jets—joining the NHL. However, only one of these former WHA teams, the Oilers, is still in its original market. The Nordiques became the Colorado Avalanche in 1995, the Jets became the Phoenix Coyotes in 1996, and Whalers became the Carolina Hurricanes in 1997. The NHL eventually returned to Winnipeg in 2011 when the Atlanta Thrashers became the current-Winnipeg Jets. ^ "NFL and AFL announce merger". The History Channel. ^ a b "How merger will operate". Milwaukee Sentinel. Associated Press. June 9, 1966. p. 4, part 2. ^ a b "How NFL, AFL will run from single wing". Miami News. Associated Press. June 9, 1966. p. 16A. ^ a b c Schramm, Tex (June 20, 1966). "Here's how it happened". Sports Illustrated: 14. Retrieved May 21, 2016. ^ a b Maule, Tex (January 1960). "The shaky new league". Sports Illustrated: 49. ^ "Events & discoveries: Texas competition". Sports Illustrated: 37. September 14, 1959. ^ Eskenazi, Gerald (December 15, 2006). "Lamar Hunt, a force in football, dies at 74". The New York Times. Retrieved January 22, 2014. ^ "Hunt reports NFL offer of franchise". Sarasota Herald-Tribune. September 10, 1959. p. 16. ^ "New pro football league organized". Gettysburg Times. Associated Press. August 15, 1959. p. 5. ^ Mallozzi, Vincent M. (September 17, 2006). "Defending and remembering the A.F.L." The New York Times. Retrieved June 6, 2014. ^ "Two types of footballs for Super Bowl". Chicago Tribune. Associated Press. January 15, 1967. p. 1, sec. 2. ^ "J6-V". Remember the AFL. Retrieved May 16, 2017. ^ "Television's next on pro ball agennda". Miami News. Associated Press. March 27, 1960. p. 3C. ^ a b "American Football League may be expanded in 1966". Nashua Telegraph. Associated Press. May 23, 1964. p. 8. ^ Hand, Jack (May 18, 1966). "Giants sign Bills Pete Gogolak; move could provoke pro grid war". Lewiston Daily Sun. Associated Press. p. 13. ^ a b Curran, Bob (September 11, 1966). "The truth behind pro football's merger". Spartanburg Herald-Journal. p. 6. ^ Mann, Jimmy (October 25, 1966). "Gogolak brings serfs forward". St. Petersburg Times. p. 3C. ^ a b Shrake, Edwin (August 29, 1966). "The fabulous Brodie caper". Sports Illustrated: 16. ^ "Roman Gabriel says he belongs to Rams, not Raiders". Sumter Daily Item. Associated Press. May 27, 1966. p. 10. ^ "The AFL–NFL merger was almost booted... by a kicker". NFL.com. ^ "When Lombardi sacked Milwaukee's bid to land a pro football franchise". jsonline.com. ^ "Super Bowl covers". National Football League. Retrieved January 22, 2014. ^ Grey Beard (April 17, 2017). "Lost Treasures of NFL Films-Episode 4: The American Football League" – via YouTube. ^ "Woodard new boss in AFL power shift". Milwaukee Journal. Associated Press. July 26, 1966. p. 13, part 2. ^ "Art Modell interim president for NFL". Miami News. Associated Press. May 27, 1967. p. 1B. ^ "Paul Brown". Conigliofamily.com. Retrieved December 16, 2013. ^ Bledsoe, Terry (December 21, 1969). "Pro football's realignment is already behind schedule". Milwaukee Journal. p. 3, part 2. ^ Cooper Rollow (January 17, 1970). "Rozelle Lottery Leaves Bears 'Cold': Realignment Keeps Central Group Intact". Chicago Tribune. Retrieved May 21, 2016. ^ "Secretary solves pro grid hassle". Beaver County Times. Pennsylvania. United Press International. January 17, 1970. p. B3. ^ "Continental League of baseball announced..." rarenewspapers.com. ^ "World Hockey Association History". Connecticut Hockey Hall of Fame and Museum. Archived from the original on December 2, 2013. ^ "Colorado Avalanche - Team". nhl.com. June 30, 2013. Archived from the original on June 30, 2013. ^ "Atlanta Loses Thrashers as N.H.L. Returns to Winnipeg". The New York Times. June 1, 2011. Magee, Jerry (February 22, 2004). "Rozelle's Pledge to Congress Gets Swept Under Rug". San Diego Union-Tribune. Archived from the original on April 30, 2006.